MOSCOW, February 6. /ITAR-TASS World Service/. On the eve of the 2014 Sochi Winter Olympics, officially opening on February 7 the sports world and the community of fans around the world have caught their breath in anticipation. Six thousand athletes, 12,000 journalists, 25,000 volunteers, 1.2 million tourists and 3 billion television viewers around the world — these figures alone indicate the Olympics are a truly global event. Russian President Vladimir Putin has said that the very instance of the Winter Olympics being held in Sochi can be regarded as Russia’s triumph. The opening ceremony due on Friday will herald the beginning of a sports marathon that will last till February 23. Paralympics will follow at the very same facilities on March 7-16. This is a second time Olympic Games are being held in Russian territory. Back in 1980 Moscow welcomed the 22nd Winter Olympics. The mascots of the Sochi Games are the Polar Bear, the Snow Leopard and the Doe Hare, and the motto — Hot, Cool, Yours. What makes the Sochi Olympics so unique is that for the first time ever winter games are being held in a subtropical city. Sochi’s guests enjoy no end of contrasts on a warm coast of the Black Sea and Alpine skiing routes on the steep slopes of the Caucasus Mountains. The Olympics set a record way before its beginning. 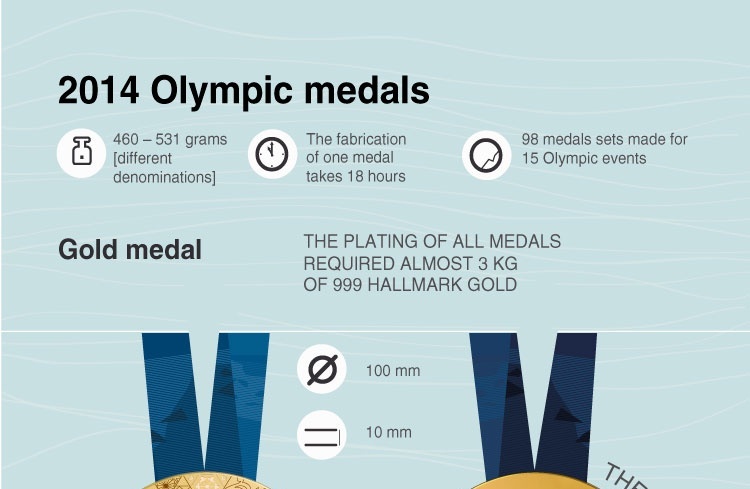 A total of 98 sets of medals will be contested — 12 more than in Vancouver in 2010. By the number of newly-introduced disciplines Sochi has gone ahead of all Olympics held in the previous twenty years. The number of countries represented - 88 against 82 in Vancouver — is another achievement. The number of coined medals is also a record — 1,300. The organizers obviously decided to be generous - the cost of one gold award is estimated at $6,000, which is 12 times more than in Vancouver. Each medal is a hand-made works of art and a masterpiece of goldsmiths’ craftsmanship. The Olympic torch relay race has proved unprecedented in scale, too. It lasted 123 days and measured 40,000 kilometers in length. A total of 14,000 torch carriers took part in the relay. The Olympic flame was taken to the Caucasus’ tallest peak — Mount Elbrus, lowered to the bottom of Lake Baikal and visited the North Pole and the International Space Station. The 2014 Sochi Winter Olympics will be held at eleven sports facilities, grouped into two clusters — one in the mountains, and the other, on the seaside, in the Imereti Lowlands. The Olympic Park is the main feature of the Coastal Cluster. It is a complex of sports facilities capable of accommodating 75,000 visitors at a time. It consists of the Olympic Stadium Fisht, the Bolshoi ice dome, the Shayba ice stadium, the curling centre Ice Cube, the winter sports palace Iceberg and the speed skating rink Adler Arena. The Fisht stadium seating 40,000, is meant for the opening and closing ceremonies of the Olympics and Paralympics, as well as for the decoration ceremonies. The stadium owes its name to the same-name mountain in the Caucasus and resembles a high cliff in shape. From the stands the spectators will be able to enjoy the show and other events on the pitch, and the splendid views of the mountains and of the expanse of the sea. The mountain cluster of the Sochi 2014 Olympics comprises five sports facilities: the Laura skiing and biathlon complex, the Alpine skiing centre Roza Khutor, the RusSki ski jump centre, the luge centre Sanki and the extreme park Roza Khutor. The Roza Khutor center will host all Alpine skiing disciplines of the Olympics and Parlympics — supergiant slalom, giant slalom, downhill and slalom. The Alpine skiing courses total 20 kilometers in length. Rosa Khutor seats 7,500 spectators. The extreme park Rosa Khutor will be used for holding two sports competitions - freestyle and snowboarding. Over the seven years since Sochi was declared the venue of the 2014 Winter Olympics the region has created an advanced transport infrastructure — eight flyovers, 102 bridges, tens of tunnels and a bypass route for heavy trucks — 367 kilometers of roads all in all. The airport has undergone fundamental upgrade. Its throughput has been increased to 3,800 passengers an hour against the previous 900. The Tuapse-Adler railway 102 kilometers long has been upgraded and a new railway station built in the centre of Adler. This six-tier transportation hub is the biggest in southern Russia. 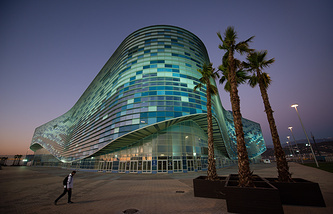 The Sochi seaport has acquired a new look. A long string of piers has emerged along the coast connected by a shuttle boat service. Special attention has been paid to communications. The region now has mobile radio communication links and digital television broadcasting and 700 kilometers of optical fiber lines has been laid. Sochi has taken security measures that are unprecedented in the history of the Olympic movement. A total force of 30,000 police and security service agents, including foreign ones, will be involved in the effort. The number of security personnel is ten times greater than that at the Salt Lake City Olympics held in 2002, months after the September 11 terrorist attacks in New York. Special radars will be tracking the movements of submarines in the Black Sea. Drones will be covering Olympic facilities from the air. Space monitoring will be used, too. 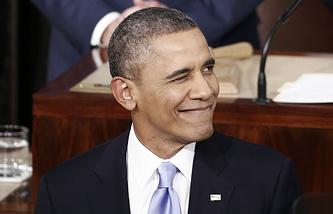 Barrack Obama has appreciated the super-efforts exerted by the Olympics’ organizers. “I believe that Sochi is safe. They (organizers) understand that there are potential threats there, and we are coordinating with them,” he said. International Olympic Committee members, too, are quite pleased with what they saw in Sochi on the eve of the opening. 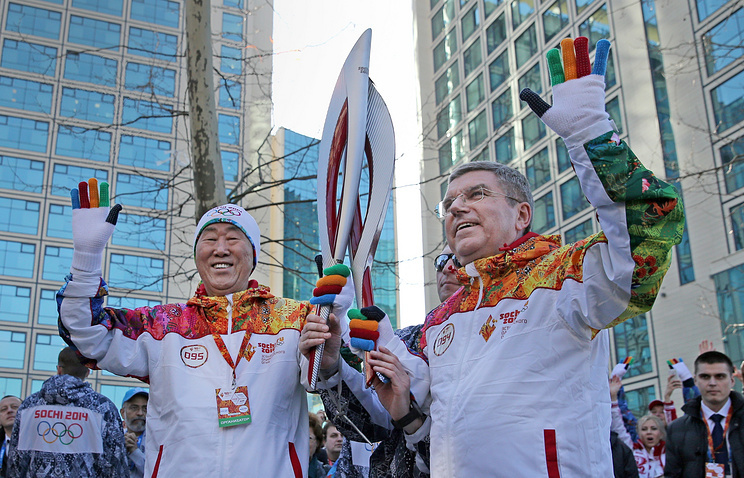 IOC President Thomas Bach said all arriving athletes and he felt excited. The scale of the forthcoming event looked just amazing and nothing of the sort had been seen at the previous Olympics, Bach said.